Derrick Jones is a US-born pro basketball player who plies his trade with NBA side – the Miami Heats. He began his professional career in 2016 after a one-year college spell at the University of Nevada, Las Vegas. He was signed by the Phoenix Suns in September 2016 after going undrafted in the NBA draft of that year. Jones eventually joined the Miami Heat in late 2017 after spending a little over one year with the Suns. Derrick Labrent Jones Jr. was born on February 15, 1997, in Chester, Pennsylvania to Otiesse and Derrick Jones Sr. He grew up with 3 siblings, a brother named Lakeem and two sisters, Dej’sha and On’Jesha. He had his high school education at Archbishop John Carroll High School in Radnor, Pennsylvania. Among other notable highlights of his high school career, Derrick Jones helped his school go 23–7 overall in his senior year (2014-15) and averaged 19.2 points, 10.1 rebounds and 2.3 blocks in 21.5 minutes per game. His brilliant performance earned him the Southeastern Pennsylvania Player of the Year, the Delaware County Player of the Year and the PIAA Triple-A Player of the Year awards and he equally received first-team All-Catholic League honours. He became the highest scorer in the history of Archbishop Carroll high having cumulated 1645 points, 1029 rebounds and 268 blocked shots during his 4-year high school career. Widely considered a 4-star recruit, Jones made a commitment to have his college career at the University of Nevada, Las Vegas. In his freshman season (2015-16) with the UNLV Runnin’ Rebels, he was the team’s second highest scorer as he averaged 11.5 points and 4.5 rebounds in 30 total appearances. He also recorded five 20-point games and 4 double-doubles for the season among other noteworthy accomplishments. However, his brilliant run for the season was brought to an end in late February 2016, owing to a controversy surrounding his ACT test scores. Consequently, he was forced to sit out the Runnin’ Rebels’ last 3 games for the 2015-16 NCAA season. Derrick Jones entered the 2016 NBA Draft on April 7, 2016, however, he retained the option of returning to college by not hiring an agent. He went back on his initial plan and chose to hire an agent later in the month but eventually, he went undrafted in the NBA draft of 2016. Despite not getting selected in the 2016 draft, Derrick Jones landed a contract with the Phoenix Suns on September 25, 2016. He marked his NBA debut in his native state when the Suns faced the Philadelphia 76ers on November 19, 2016. He marked his NBA scoring debut in the Suns’ December 15 game against the San Antonio Spurs, recording 3 points in 3 minutes of play. For the greater part of the 2016–17 season, Jones was assigned to the Northern Arizona Suns, the Phoenix Suns’ NBA G League affiliate. However, he was named for the 2017 NBA Slam Dunk Contest and made it all the way to the final of the competition before losing out to eventual champion Glenn Robinson III. Jones’ playing time improved slightly in the latter part of his rookie season and he finished the season with an average of 5.3 points and 2.5 rebounds in 17.0 minutes per game in 32 total appearances. He joined the Suns for the 2017 NBA Summer League and also made 6 appearances in the 2017-18 NBA regular season before eventually exiting the team in December 2017. 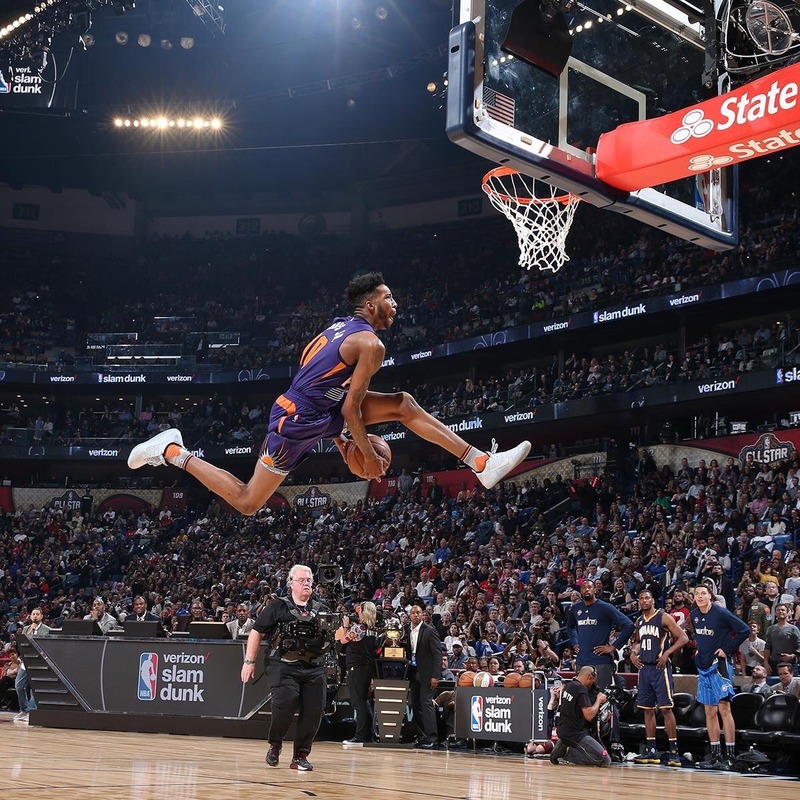 After having his contract not renewed by the Phoenix Suns, Derrick Jones was acquired by the North Arizona Suns on December 12, 2017. He made 16 total appearances with the team for the season before ultimately joining NBA side Miami Heat on a two-way deal on December 31, 2017. Based on the nature of his contract, Jones shared his playing time between the Heat and their minor league affiliate the Sioux Falls Skyforce for the remainder of the 2017-18 season. For the Heat, he featured in 14 games with 8 starts during which he averaged 3.7 points and 2.4 rebounds in 15.1 minutes per game. On July 1, 2018, Derrick Jones penned a standard 2-year contract with the Miami Heat valued at $3,157,958 with an average annual salary of $1,578,979. With the first year of the contract guaranteed, the NBA star is billed to earn $1,512,601 for the 2018-19 season. His base salary will be upped to $1,645,357 for the 2019-20 season which is a team option. Derrick Jones stands at an impressive height of 6 feet 7 inches (201 cm) and maintains a body weight of 91 kg (200 lb). He is a versatile player and is able to thrive in both the small forward and the shooting guard positions.